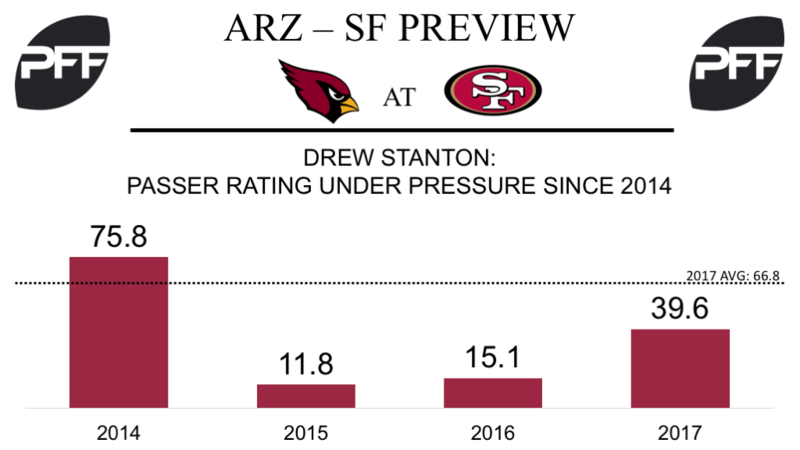 QB Drew Stanton vs. the 49ers pass-rush – With starting quarterback Carson Palmer likely to miss the remainder of the season with a broken arm, the Cardinals will turn to eleventh-year backup Drew Stanton to take the reins for the offense, and the team’s offensive hopes will likely come down to how well Stanton handles the pressure produced from a talented 49ers pass-rushing unit. Throughout his career, Stanton has been underwhelming under pressure, and has completed just 54-of-147 pressured attempts for just three touchdowns, seven interceptions and a passer rating of just 40.8. This needs to improve if he’s to succeed against a 49ers defense that has produced 133 total quarterback pressures so far this season, the eighth most among the league’s teams, and have collectively produced pressure on 10.4 percent of their pass-rush snaps. T D.J. Humphries vs. Edge Elvis Dumervil – After missing time early in the season with a knee sprain, the third-year offensive tackle has shown promise in his last two games, and has allowed just four hurries on 59 pass-blocking snaps, for a pass-blocking efficiency of 96.2 that ranks 23rd of 72 offensive tackles with at least 25 pass-blocking snaps during that span. While that doesn’t sound particularly impressive, it is worlds away from his preseason performance in which he allowed two hits and three hurries on just 31 pass-blocking snaps, which ranked 132nd of 135 offensive tackles. The Cardinals will hope that Humphries can build on his recent performance, but it’ll be a tough ask against Elvis Dumervil. Dumervil has excelled as a pass-rush specialist this season, producing 17 total quarterback pressures on 109 pass-rushing snaps, for a pass-rush productivity of 12.6, good for sixth among 3-4 outside linebackers. WR Larry Fitzgerald vs. CB Ahkello Witherspoon – At the mid-way point of the season, a 34-year-old Fitzgerald is showing absolutely no signs of slowing down, and has consistently ground out performances to help his team. Through eight games, Fitzgerald leads his team in targets (61), receptions (45) and receiving yards (494) and has generated a passer rating of 113.7, good for 12th among the league’s receivers. Rookie cornerback Ahkello Witherspoon has his work cut out for him if he’s to keep up with the wily veteran, but he could find inspiration from a great Week 8 performance in which he allowed just three catches from eight targets and recorded the first interception of his career, on the way to a game grade of 88.1. 49ers left tackle vs. 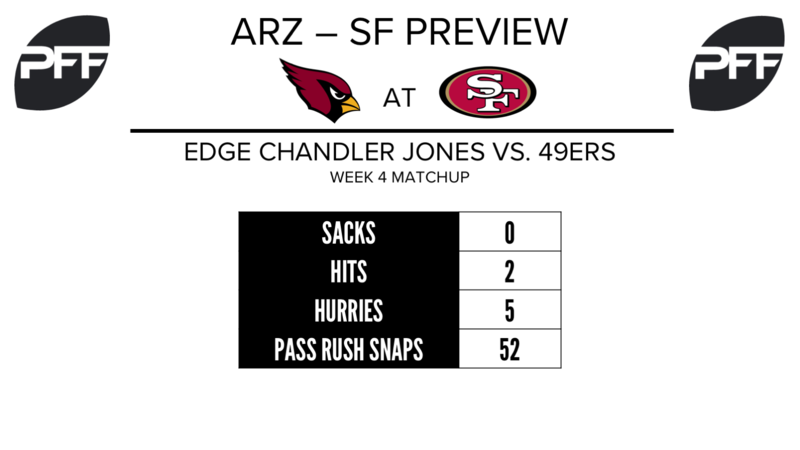 Edge Chandler Jones — Joe Staley, San Francisco’s starting left tackle, is likely out until at least the bye week after suffering a broken orbital bone last week in Philly, leaving an already shaky offensive line without its best player. Who replaces him remains a bit hazy at the moment, but the safe money appears to be on right tackle Trent Brown making the move across the line. Brown has one career start at left tackle, Week 16 of last season against the Rams. In that game, Brown allowed just one pressure in 48 pass-block snaps. He’ll have his work cut out for him against Chandler Jones, who leads the Cardinals in sacks (8), hits (7), and hurries (20). Those 35 total quarterback pressures are tied for the seventh-most among edge defenders this season. WR Trent Taylor vs. CB Tyrann Mathieu — With top wide receiver Pierre Garçon landing on IR, the 49ers will now be relying on a myriad of young players to carry the passing game. Among them will be fifth-round pick Trent Taylor, who serves as the team’s primary slot receiver. Taylor was one of college football’s most prolific slot receivers during his career at Louisiana Tech, but has so far been unable to reproduce that performance in an underwhelming 49ers’ passing attack — his 0.94 yards per route run from the slot ranks 42nd out of 57 qualifying wide receiers. On Sunday, he’ll match up with Mathieu, whose 49.1 overall grade would be the worst of his career if he’s unable to turn things around over the second half of the season. Mathieu’s 1.50 yards allowed per cover snap in the slot ranks 33rd of 46 qualifiers on the season. QB C.J. Beathard on downfield passes — A mere three games into the C.J. Beathard era and we already have an expiration date after the 49ers traded for Jimmy Garoppolo before the trade deadline. It’s been a rough go for the rookie signal caller, whose 47.4 overall grade is the second-worst among qualifying quarterbacks on the season. Kyle Shanahan has understandably kept the gameplan conservative so far, with 78.4 percent of Beathard’s throws traveling nine yards or less in the air, the league’s highest rate. When targeting players 10 yards or more downfield, Beathard has put the ball in a catchable location just 54.2 percent of the time, ranking 31st of 36 passers with at least 20 such throws. If San Francisco has any hope of finding their first win this week, Beathard must find a way to connect on throws down the field.